Person in wheelchair uses whiteboard at brightly lit workplace. It’s a question that doctors, photo editors and kids have asked me. Strangers have taken my hand and prayed for me. Even some of my close friends, who know that I am a proud disabled activist who wears a tracheostomy tube, have admitted that they hope, one day, I can undergo a procedure to get rid of my disability once and for all. “So you can lead a normal, healthy life,” they say. A part of me understands that people are expressing genuine concern for my health — but they don’t realize how painful and ableist it really is. There’s a common assumption that people with disabilities all have a desire to or need to be cured, according to Stephanie Woodward, the director of advocacy at the Center of Disability Rights. The idea of needing to “fix” or “cure” disability communities automatically assumes a negative relationship between people and their disabilities. It also perpetuates the misconception that disability is something to be ashamed of. In reality, disability is a complex identity, and disabled people are multifaceted non-monolithic human beings. I am proud, like many people, to be disabled. When people suggest that my life would be better without my disability, it feels like they’re rejecting me as a person. Unfortunately, cure-focused narratives have deep roots in systemic ableism and continue to persist today. When news broke out that Stephen Hawking had died, public figures and media outlets alike were quick to frame his disability as a burden. While such hopes and peaceful wishes may be grounded in good intentions, they ultimately shame people with disabilities for their identities. Instead of assuming that all disabled people want or need a cure to “fix” their disabilities, society must focus on dismantling ableism and actually improving accessibility and quality of life for all disabled people. Not once did he ever ask what I wanted. I realized years later that perhaps it didn’t even occur to him that our goals didn’t align. That I didn’t want to get rid of my disability. After all, I’d had vocal cord paralysis and worn a tracheostomy tube for my entire life and it was all that I’d never known. I couldn’t imagine not having a trach, not being disabled. For years, I wondered if something was “wrong” with me for being disabled and OK with it. It took a long time before I realized that I was internalizing the ableism that society was imposing on me. “In truth, my answer has been that I wouldn’t take it because I have no idea who I would be without this particular body, with all of its tremors, all of its slurs, all of its tension,” Clare says. But according to the social model of disability, people with disabilities are disabled not because of their individual differences, but because of the systemic barriers we face in society. That includes everything from inaccessible buildings to hiring discrimination to a general attitude of resistance against disability. While motivations for finding a cure varies widely among disabled people, Woodward says they often stem from a lack of accessibility and feeling isolated in society — which is a fault of systemic ableism, not the person. In a perfectly accessible world where all disabled people are fully included in society and treated equitably, the pressure to conform likely wouldn’t exist. Everyone would have the freedom to exercise full bodily autonomy. “We focus so much on fixing the individual to fit into society, rather than fixing our society to be welcoming to all of our people,” Woodward says. Although cure-focused narratives can be harmful, health care and access to treatments are still important. It’s true that cure has made a big difference in many disabled people’s lives. Cures have saved lives and provided comfort for people who, for instance, live with chronic pain. But Alice Wong, 44, founder of the Disability Visibility Project, says it’s important not to frame cure as a moral and social good that guarantees a life without suffering. “There is a distinction between discussing the harmful rhetoric around cures and the legitimate desire for relief and treatment,” says Wong, who was born disabled and lives in San Francisco, Calif.
For Wong, receiving treatments like a spinal fusion surgery was helpful — but they weren’t cures. They only served to make her life better. 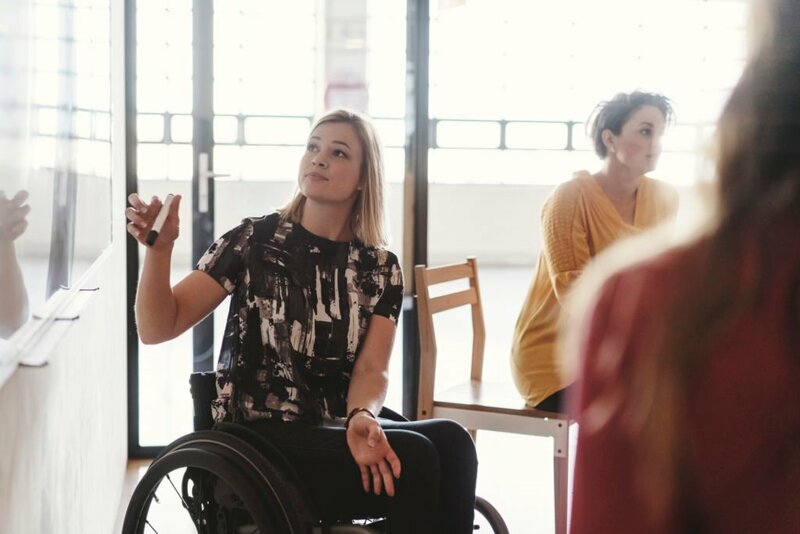 Rather than totally rejecting cures, the problem lies in how society prioritizes some lives over others, says Clare, who regularly speaks and hosts workshops on disability. When cure functions as a type of social control or pressure to eradicate disability communities, it becomes the opposite of liberation. Especially for people whose disabilities don’t have cures, this mindset can make them feel trapped or inadequate. Cure-focused ableism, like other forms of discrimination, exists because society is structured to uphold people with privilege and deprive others of power, Wong says. But everyone has power, agency and value inside of them. Just because someone walks and another person uses a wheelchair doesn’t mean one is superior to the other. If disabled people could fully participate in society, we can uproot all forms of ableism — including cure-focused narratives, Woodward says. In education, that means teaching kids in integrated classrooms. When non-disabled children study alongside disabled children instead of learning separately from the “special education” classroom, they are less likely to discriminate and more likely to view their disabled peers as equals. In the media, that means hiring disabled people to present their own stories to the public instead of publishing disability narratives from the perspectives of non-disabled people. So is it ever OK for someone to pray or express wishes for a disabled person’s cure? Strangers should never offer prayers, wishes or suggestions for cures and treatments. But even loved ones need to be mindful.